Heat transfer area: 2.94 sq.m. or 31.64 sq.ft. 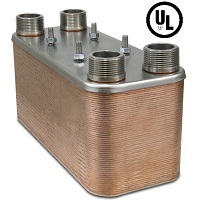 Applications: BT Series heat exchangers are designed especially for hydronic heating and cooling applications, including radiant heating, ice and snow melt applications, domestic hot water heating (DHW), outdoor wood stove and wood boiler heating, hydraulic oil cooling, and many other water to water heat exchanger and liquid to liquid applications; can be used as a general alternative to shell & tube heat exchangers.